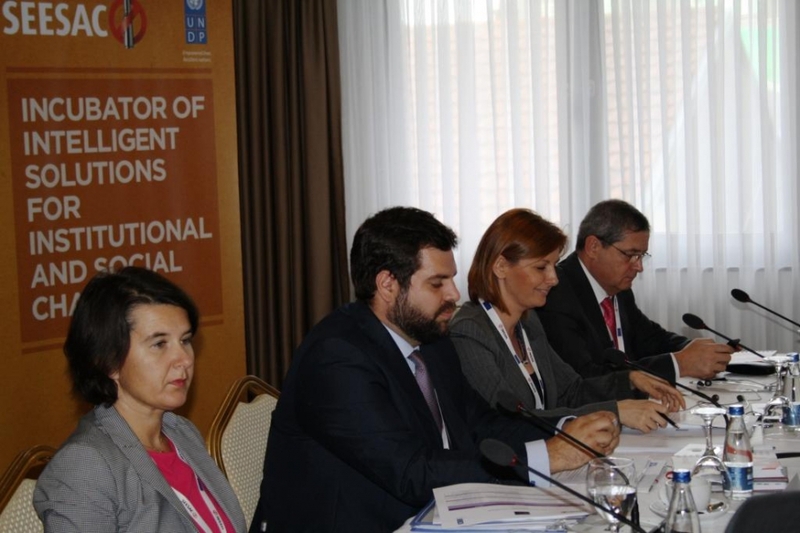 PRISTINA, KOSOVO — The South Eastern and Eastern Europe Clearinghouse for the Control of Small Arms and Light Weapons (SEESAC) held the 3rd Formal Regional Meeting of Small Arms and Light Weapons Commissions on 28-29 October 2014 in Pristina, Kosovo*. The United Nations Institute for Disarmament Research (UNIDIR) contributed to the meeting by introducing ISACS and engaging with the Commissions on the methodologies of conducting SALW surveys through the use of ISACS and its Assessment Tool. The formal meetings of the Regional SALW Commissions are an activity implemented under the EU Support of SEESAC Disarmament and Arms Control Activities in South East Europe (EUSAC) project. These regional meetings provide a unique opportunity for SALW Commissions in the Southeast Europe region to exchange of information and best practices related to SALW control. UNIDIR provided an overview of ISACS and explained how ISACS Module 5.10 on conducting SALW surveys could assist the Commissions to design, monitor and evaluate such programs. Participants in the workshop completed a practical exercise on the use of the ISACS Module 5.10, examining the essential types of SALW data to be collected in order better to understanding the distribution and impact of small arms at the national level. The regional meeting was attended by representatives of Albania, Kosovo*, Moldova, Montenegro, and the former Yugoslav Republic of Macedonia. The meeting was facilitated by SEESAC, UNIDIR and the Small Arms Survey and was observed by representatives of the Regional Cooperation Council (RCC), and the OSCE.